How can investors enter the market while the price of uranium is down? Here’s a look at stocks, ETFs and uranium futures. Many have been waiting for uranium to have its day in the sun. And as the trend toward green energy continues, some believe that day is soon to come. However, the price of uranium has faced difficulties since the 2011 Fukushima disaster. Oversupply and caution have plagued the market, and investors and companies have struggled to stay optimistic. In recent months rays of hope have returned to the market. High-profile supply cuts from major producers like Kazatomprom and Cameco (TSX:CCO,NYSE:CCJ) have raised expectations of higher prices, and optimistic market watchers are beginning to position themselves for potential gains. But how do traders invest in uranium? Unlike gold, owning physical uranium is not possible. Indeed, considering the metal’s radioactive characteristics, it’s definitely not recommended to store it in your residence. So where does that leave investors? When looking at stocks beginners may want to start by considering the world’s largest uranium producers. Those include companies like Cameco, as well as Rio Tinto (NYSE:RIO,ASX:RIO,LSE:RIO) and BHP Billiton (NYSE:BHP,ASX:BHP,LSE:BLT), among others. Of course, these large uranium producers are not the last word in uranium — in fact, there are quite a few exploration and mid-tier companies that investors may want to look at. As a starting point, you can check out our list of the top-performing TSXV-, TSX- and ASX-listed uranium stocks. Another interesting option for uranium investors is Uranium Participation (TSX:U). The company holds physical stockpiles of uranium and its share price tracks the underlying price of uranium. In this way, it provides investors with exposure to physical uranium. Finally, those interested in investing in uranium stocks may want to look to companies focused on the countries that produce the most of the metal. Last year, the three top uranium-producing countries were Kazakhstan, Canada and Australia. For investors who want exposure to the market while the price of uranium is low, but crave the diversity of a basket of equities instead of single stocks, exchange-traded funds (ETFs) are generally the way to go. Unfortunately for uranium investors, the selection of uranium-focused ETFs isn’t very wide — in fact, there are only two options to choose from. For starters, investors can look at Global X Funds (ARCA:URA), which tracks a basket of uranium miners. The fund is comprised of companies across the US and globally. The alternative to that ETF is the Van Eck Market Vectors Uranium + Nuclear Energy ETF (ARCA:NLR), which tracks a market-cap-weighted index of companies in the uranium industry. As a third option, investors can look to the futures market while the price of uranium is down. Futures are financial contracts that obligate the buyer to purchase (or seller to sell) an asset like a physical commodity or financial instrument at a predetermined future date and price. In terms of uranium futures, investors once again have few options. CME Group (NASDAQ:CME) offers UxC uranium U3O8 futures. These contracts track U3O8, and each one represents 250 pounds of uranium. The NYMEX also provides investors with a U3O8 futures trading option. Futures are an important part of the market as there is currently no exchange-listed, transparent price instrument that consumers and suppliers can use to manage prices and risk. Furthermore, uranium futures provide investors with a marketplace for direct exposure to the price of uranium. Uranium investing: Why pick uranium? When it comes to uranium investing, especially while the price of uranium is depressed, the thesis is simple: many investors believe that the market could be on the cusp of a renaissance. Believers include Rick Rule of Sprott US Holdings, who said in early 2018 that he sees uranium as a “when” question, not an “if” question. 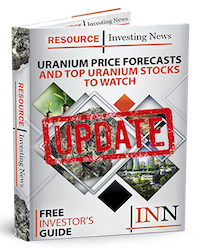 He thinks 2018 could be the year uranium turns, and reiterated his optimistic viewpoint midway through 2018. Others have expressed a little more caution. For example, Mercenary Geologist Mickey Fulp has emphasized that uranium is a “boom and bust commodity” — while he believes the tide will eventually turn for uranium, he has said that it’s impossible to say when that will happen. “Not even insiders have an idea of when this is going to turn because the market is so opaque,” he has said. Those who believe in the uranium story and feel comfortable getting into the market while the price of uranium is low may want to consider the three options laid out above. As the need for clean energy grows and oversupply diminishes, investing while the price of uranium is down could be an opportunity.